Real Madrid bagged another 3 points this Sunday night, after visiting Athletic Bilbao and defeating the home side by a clear 0-3 result. Cristiano Ronaldo stood out with 2 goals and 1 assist, reaching the 50-goals mark this season. The Portuguese superstar is now only 10 goals away from setting a new personal record in a club season. The San Mamés stadium hosted the last Athletic Bilbao vs Real Madrid clash of its long history this past Sunday, as the club is preparing to move to a new stadium (the 'Estadio San Mamés Barria'), right next season. However, the "rojiblancos" fans won't keep a great memory from this match, since they ended up spending most of the time booing, whistling and insulting Ronaldo, precisely the man who teared Athletico apart with 2 goals and 1 assist. The Merengues left Bilbao with a comfortable 0-3 win and will remain 2nd in La Liga, 3 points clear from Atletico Madrid, but still 13 points under Barcelona, who has also won 0-3 this Sunday afternoon, against Real Zaragoza. The Merengues kicked off this game guns blazing and it took no longer than 2 minutes for Cristiano Ronaldo to open the hostilities in Bilbao. It was the Portuguese second fastest goal in his career, only falling short to his 45-seconds goal in a game against Xerez, back in 2009. This Sunday, the Real Madrid forward found the back of the net from one of his trademark tomahawks free-kicks, reaching his 3rd goal from set-pieces this season and putting the Merengues on the lead right from the beginning. The home side reacted well and managed to clearly win the ball possession battle during the first 45 minutes. Bilbao showed some good skills on the ball and forced the Merengues to chase them in many periods of the first half. However and despite having had the ball for most of the time, Marcelo Bielsa's men struggled to put Real Madrid into serious trouble and only created one or two good occasions from which they could have actually scored. Fortunately for the Merengues, Diego López showed why he has been relegating Iker Casillas to the bench lately and why he continues deserving Mourinho's trust as the team's first choice for goalkeeper, after another couple of brilliant stops to some dangerous shots from Athletico Bilbao attacking players. 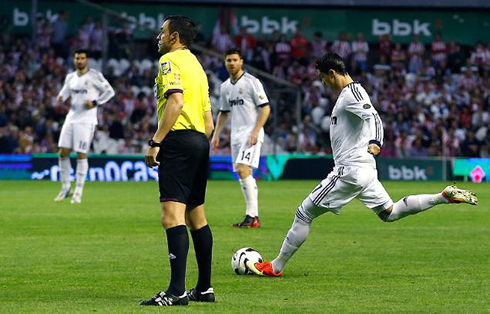 The second goal of the night came from a Cristiano Ronaldo header, around the 68th minute of the game. Xabi Alonso took a free-kick on the right, crossed the ball into the far post and saw CR7 jumping over Ramalho to head it past Iraizoz. Everything seems easier when the Portuguese star is on the pitch and suddendly, Real Madrid were 2 two goals up, with barely 20 minutes left to be played. Bilbao weren't showing any signs of being capable to threaten the Merengues on the back and this last game between these two clubs at the San Mamés seemed destined to end with a Real Madrid win. There was still a final blow about to be given 8 minutes later though, and Cristiano Ronaldo was involved in the play once again. Real Madrid's number 7 held on to the ball for a few seconds, timed a perfect pass for Higuaín that went through a defender's legs and the Argentinian struck it strongly to the far post, leaving no chance for Iraizoz to even put his hands on it. Ronaldo would be replaced on the pitch in the 78th minute, knowing he had done his job once more, as Real Madrid was about to pick the 3 points from San Mamés. With these two goals against Athletic Bilbao, Ronaldo reached the 50-goals mark this season (31 in La Liga; 6 in the Copa del Rey; 2 in the Spanish Super Cup; 11 in the Champions League) and prepares to enter the final stage of the season in superb form. The Portuguese player scored 11 goals on his last 8 games and has found the back of the net at least once, in every one of those 8 matches. We can't really ask for more, can we? Cristiano Ronaldo next game for Real Madrid will be a home fixture for La Liga, against Betis, on April 14, 2013. You can watch Juventus live stream, Real Madrid vs Betis, Bayern Munich vs Wolfsburg, West Ham vs Manchester United and Arsenal vs Everton, all matches provided from our soccer live streaming section.